There are an infinite range of ingredients and flavours that can be combined to create new and interesting versions of Fried Rice. According to my Mom, fried rice is more of a formula than a single recipe. 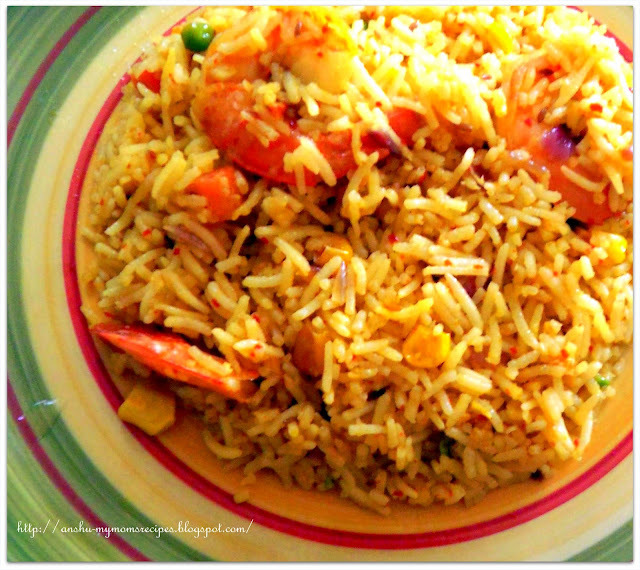 Shrimps......ahh....the very first member of fish family with which I started eating Non-Vegetarian dishes....I was a great lover of Fried Rice....and these days one of my favourite fried rice dish is the Shrimp Fried Rice. Heat a wok (you need a large wok or pan for this) till the surface is almost smoking. Then add the oil and spread it around till it coats the surface evenly. Add the shrimps and fry till they turn red. Remove and set aside. In the same oil, add garlic, onions, green chilis, carrots and beans and stir well for 5-7 minutes and then add soya sauce and toss around for another 1 minute. Push ingredients aside by making a well. Add a tablespoon of oil in the center and break eggs into the oil. Once eggs are semi-cooked, add rice and fried prawns and push ingredients into it. Stir evenly and press rice to separate grains from one another. Add the seasoning of salt, pepper and sugar. Fry the rice for another 4-5 minutes stirring continously until the seasoning is evenly distributed.